Bohr’s atomic model was introduced in 1913 by Niels Bohr. Bohr atom is a planetary model, where the electrons are in stationary circular orbits and the electrons orbit the nucleus at set distances, and it is based on laws of Plank and Einstein’s photoelectric effect. The Bohr’s atomic model was an expansion on the Rutherford model. Bohr’s atomic model overcame the several flaws of Rutherford model. Rutherford’s atomic model leaves many questions, because Rutherford’s electrons lose energy, collapsing on the atom itself; also, Rutherford’s atomic model was not compatible with Maxwell’s laws. The Bohr’s atomic model is important because it describes most of the accepted features of atomic theory and explains the Rydberg formula. Also (characters) the Bohr model shows that the electrons are in orbits of differing energy around the nucleus. For Bohr(characters), the energy of an electron is quantized, that is, there is nothing between an orbit and another. The level of energy that normally occupies an electron is called the ground state. When an electron changes orbit it makes a quantum leaps. The difference between the two orbits (ground state and electron’s excited state) is emitted by the atom with photons. The Bohr’s atomic model shows that each electron has a set energy. From the electron’s excited state, the electron can return at its ground state. Bohr discovered also that the closer an electron is to the nucleus, the less energy needs; conversely, the further an electron is from the nucleus, the more energy it needs. He also discovered that each energy level may contain varying quantities of electrons. Even if it contains some errors, the Bohr model is very important. The energy of the orbit is related to its size. Bohr used Planck's constant and obtained a formula for the energy levels of the hydrogen atom. Bohr postulated that the angular momentum of the electron is quantized. For Bohr the light is a electromagnetic radiation of a particular nature. Planck thought that the light was formed by packets of energy, called quanta; each quantum has a respective frequency. Planck's law was formulated to explain the radiation emitted by a blackbody. 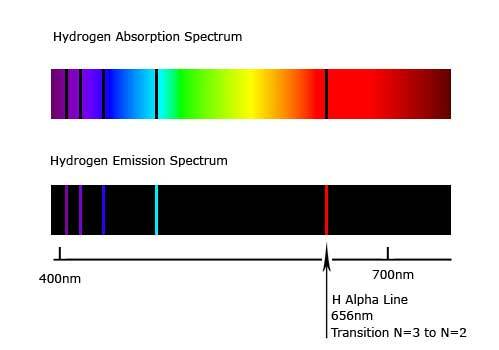 For a blackbody that does not exceed the hundreds of degrees, many of the radiation emitted are in the infrared part of the electromagnetic spectrum. At higher temperatures, a part of the radiation is radiated as visible light. The value of Planck’s constant 6.62606957 × 10−34 joule∙second, with a standard uncertainty of 0.00000029 × 10−34 joule∙second. Einstein, for explain the photoelectric effect, said that the light was formed by packets of energy, called photon. A bright light emits many photons. Einstein’s photoelectric effect is based on experiments conducted on a metal foil bombarded with electromagnetic energy, where electrons may be expelled only if they have the same frequency of the energy administered. Bohr takes an atom of hydrogen and administered energy, and the atom, overcome the maximum threshold, changed orbit (1 to 2, 2 to 3…). Bohr discovered 7 orbit in the hydrogen atom. This phenomenon is corresponded with the studies by Balmer. Balmer discovered which the spectrum was formed from various wavelengths, and all the wavelengths had got various frequencies. The energy released by electrons occupies the portion of the electromagnetic spectrum that we detect as visible light. Small variations are seen as light of different colors. All colors of the visible spectrum are visible when the white light is diffracted with a prism. But, when the light emitted by a hydrogen atom is fragmented, not all colors are visible. As Bohr thought that the electrons are in different energy levels, he found seven energy levels of the hydrogen atom. Bohr hypothesized then that when an electron receives energy from outside, the electron changes orbit. When the electron returns at the original orbit, the electron issued a photon and an energy transition occurred. In addition to Balmer’s series, there are the Lyman’s series and the Paschen’s series. Also the electron revolved in a circular and stationary orbit, as the Rutherford’s atomic model. Bohr’s atomic model results in an improvement of the Rutherford’s atom and each orbit corresponds to certain energy values. The energy of the photon issued corresponds at the different energy between two orbits. Bohr explained how electrons could jump from one orbit to another only by emitting or absorbing energy in fixed quanta. The Bohr’s atomic model is fine for simple atoms (such as hydrogen), but not for more complex atoms. The Bohr’s atomic model doesn’t explain the Zeeman effect, it violates the Heisenberg Uncertainty Principle, and does not work with complex atoms. 10 years later contradictions appeared to the Bohr’s atom. It was necessary to make new hypothesis and not to miss the property of particles such as the electron, proton and atom. Despite all, Bohr’s atomic model was very important, especially for the astronomy. From the atom of Bohr the quantum atomic model was born. The Quantum mechanical atomic model is based on the quantum theory: matter has characteristics both of the particles and of the waves. According to the uncertainty principle, it’s impossible to know the exact position and position of an electron at the same time; or one or the other. The quantum mechanical atomic model is based on probability; because it uses even complex shapes of orbitals, amount of space in which it is likely to find the electron. To describe the electron and their orbital four quantum numbers were introduced: “n”, “l”,”m” and “ms”. The Schrödinger equation is very important for quantum Physics. Thanks to it you can find out where the particle is, its momentum and you can solve the wave functions of the particle. The Schrödinger equation provides the behavior of a dynamic system and is a wave equation that predicts the likelihood of events. The energy is quantized and has a quantum number n, and energy can never be zero. The quantum numbers describe the position of the electron and the amount of electrons that can stand in an orbital. The angular momentum quantum number or quantum number “l”: the quantum number “l” defines the shape of orbital. It has positive integer values (0 to n-1); “l” corresponds to the s-p-d and f. The subshell are orbitals that have the same value of number quantum “n” but different values of number quantum “l”. Spin quantum number “ms”: the spin quantum number “ms” specifies the value and orientation of the axis of rotation of an electron. It has values ½ or - ½. 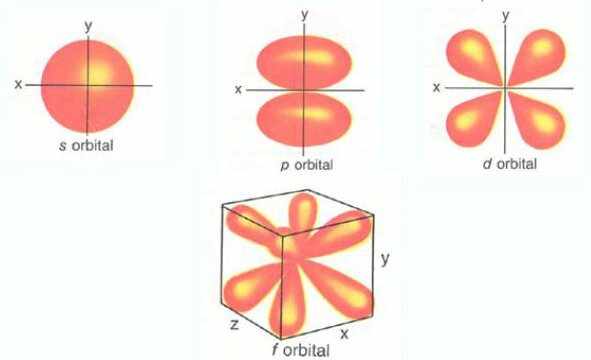 The Pauli exclusion principle states that in an orbital can be only two electron with opposite spin. The Bohr and quantum’s atomic model is very important for the science because the Bohr’s atomic model is an expansion of the Rutherford’s atomic model and it describes most of the accepted features of atomic theory and explains the Rydberg formula; the quantum atomic model because it introduced the concept of the orbital and explain the quantum numbers; also the Bohr’s atomic model is important for the discovered of the emission spectrum, which is very important in the astronomy.